Days before the sudden settlement between Apple and Qualcomm, a German appeals court had preliminarily annulled the latter's most significant courtroom victory over the former, as I found out today. After months of briefing and in-depth analysis, the Oberlandesgericht München (Munich Higher Regional Court) granted a motion by Apple to stay the enforcement of a Germany-wide patent injunction Qualcomm had obtained from the Landgericht München I (Munich Regional Court). Apple had worked around that injunction anyway, and its effects were as minimal as they were short-lived. But the implications for patent enforcement in Germany--a sizable market in which injunctions have so far (change may be coming soon) been granted as a near-automatic legal remedy. Blogs are opinion platforms, and my outspokenness and willingness to make sometimes daring predictions position me as a particularly opinionated blogger on patent matters. In fact, patent professionals sometimes share my posts on LinkedIn saying that they disagree with my views but find useful information here--which is perfectly fine, and it would be a surprise if a former anti-software-patent campaigner's positions were perfectly congruent with those of people whose job it is to prosecute or enforce patents. Nevertheless, I try hard to disagree respectfully when I disagree, and judges deserve particular respect for all intents and purposes. So only under the most egregious of circumstances would I refer to a decision as a "fake injunction," but I carefully chose that term for the injunction the Landgericht München I (Munich Regional Court) had granted to Qualcomm against Apple on December 20, 2018 on an agnostic basis, creating what I called a "defendant's dilemma": give up your secrets by letting a competitor's engineers learn about the inner workings of a chipset--or lose your case. At first I just called it an "agnostic" injunction because the court had made clear (not only at the oral announcement of the ruling but also in a written press release) that the question of whether or not a Qorvo enveloper tracker chip in the iPhone 7, the iPhone 8 and the iPHone X actually infringed Qualcomm's patent-in-suit. The decision was based on the court's determination that Qualcomm's infringement assertion, though based on an inherently unreliable (as the court-appointed expert acknowledged) teardown report, was deemed more substantiated than Apple's denial. Apple had brought along the Qorvo engineer who designed the chip. Heroically, but in vain, Mr. Mike Kay waited on a hard wooden seat outside the courtroom for about 12 hours. In early February, after a summary judgment ruling by a U.S. district judge here in San Diego (Judge Dana M. Sabraw) agreed with Apple's primary non-infringement contention (after looking at evidence and hearing testimony the Munich court never got to, and consistently with what the ITC found last year), I replaced "agnostic" with "counterfactual" or simply "fake." I did so despite truly (and still) considering Presiding Judge Dr. Matthias Zigann a leading German patent judge. And I harshly criticized, with words like "worse than the worst troll," Qualcomm (a great mobile tech innovator) and Quinn Emanuel's Dr. Marcus Grosch (a phenomenal patent litigator) for enforcing a fake injunction, which I considered unethical. Not only did Qualcomm enforce that injunction but they also obtained another one over allegedly deceptive advertising because Apple assured customers they'd still find the iPhone 7 and the iPhone 8 everywhere. That one also got lifted, but by the lower court itself (and a different panel of judges; not Judge Dr. Zigann's patent-specialized panel). The lower court erroneously rejected Apple's infringement defense as insufficiently substantiated. The lower court erroneously dismissed Apple's infringement defense (I would compare this to a successful motion to dismiss in a U.S. case, or a summary judgment to that effect). Due to a workaround, the injunction had no more impact on consumers anyway--but other injunctions on a smilar "damned if you do, damned if you don't" basis could have harmed consumers and innovation. Sanity has been restored. That's excellent news. There still are some patent-related issues with respect to which we need sanity. One of them is the question of global FRAND rate determinations by UK courts. Opening statements in the Apple, Foxconn et al. v. Qualcomm antitrust trial in San Diego (Southern District of California) were ongoing when CNBC broke the news of a settlement. A little later it was confirmed by Apple's newsroom: All pending lawsuits between Apple and Qualcomm, and Apple's contract manufacturers and Qualcomm, have been dismissed. There is a new patent license agreement as well as a new chipset supply deal in place. In other words, California's two mobile hardware giants--Apple from the North, Qualcomm from the South--are working together again. An amicable resolution of a dispute that last more than two years and was a bit acrimonious at times. Cravath Swaine & Moore's Evan Chesler finished his opening statement (with only about 20 minutes left at the time the settlement became known). Counsel talked to Judge Curiel privately, and he then explained the situation to the jury. He also invited jurors to his chambers to thank them personally for everything. A trial that could have lasted, if one includes jury deliberations, 1.5 months or more has therefore ended after only 1.5 days. This would have been a huge and extremely difficult case for the jury to decide. As always, I congratulate both parties on their deal, and in this case I think either side would have had to take quite some risk by letting a jury render a verdict on complex commercial and partly technical issues. Even though it ultimately didn't matter anymore what counsel said today, I really was impressed by Fish & Richardson's Ruffin Cordell's opening statement. One of the best explainers I ever got to listen to in a courtroom. I must admit I hadn't heard of him before, but probably will again, sooner or later. The terms of Apple's new deal with Qualcomm haven't been disclosed other than money flowing from Apple to Qualcomm, not the other way round (which could have happened after the trial in theory). Analysts will probably soon claim to know the exact numbers. We won't know whether they're right until something surfaces in future litigation. In the immediate aftermath of this settlement, the question is what this means for the FTC v. Qualcomm case that went to trial in January. Judge Lucy H. Koh of the United States District Court for the Northern District of California might rule anytime now. Or that case might get settled, too. The Federal Trade Commission of the United States deserves respect. What's obvious (and therefore not a question of respect or a lack thereof) is that there's now less of a national interest in that antitrust case than before. However, I have consistently said that the case is about important issues, not just particular companies. It could be that the FTC, whose primary job is to prevent consumer harm, decides to carry on regardless. Or they might settle in the short term. We'll see what happens. Standard-essential patents (SEPs) and FRAND licensing terms have been and will remain a key focus of this blog, of course. And, more generally, patent infringement remedies. By the way, live tweets from the courtroom were allowed again today. Mr. Cordell made a point that is very obvious: why would Qualcomm impose gag clauses with multi-billion dollar penalties attached on its customers if it had nothing to hide? The fact that Qualcomm insisted on contract terms that would make it economically irresponsible under most circumstances for companies to ask competition enforcement agencies for help indeed speaks volumes. It's about covering up misdeeds. It will be hard for Qualcomm to explain this away. It's not just that companies entering into business agreements with other companies want some peace of mind. They don't want to sign a contract one day and be sued the next day. But government agencies in charge of antitrust enforcement don't just cause one company a lot of grief because another company asks them for it. They perform their own analysis, generally starting with a first plausibility check, followed by what some call "preliminary investigations" if there's enough smoke to suspect fire, and things get real only if those agencies reach independent conclusions. As for independence there certainly is no such agency in the world that would be in Apple's pocket because the United States is just too large an economy and too well-respected a democracy for one company to control the government and in other countries Apple is just a foreign entity. So if Qualcomm had had a clear conscience, it would never have had to worry about a customer like Apple potentially complaining to independent government agencies because the agencies would just decline to investigate, or they would take a short look and stop wasting their time. Only someone who really has something to hide and, as a result, something to fear would do that. 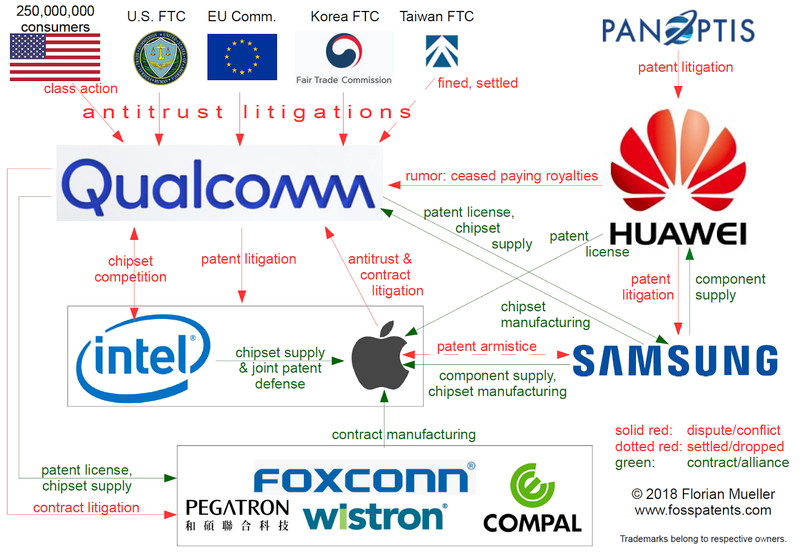 That Qualcomm had something to hide and therefore something (antitrust charges) to fear is evidenced by the battlemap chart I showed you in yesterday's post on the start of this trial (jury selection). In the aggregate, Qualcomm has been fined to the tune of many billions of dollars by regulators on multiple continents, which I once called the "Antitrust Grand Slam." The next context in which common sense complicates things for Qualcomm is the question of the royalty base. Qualcomm's royalty is based on the entire device. There is a cap now ($400), but it's dozens of times higher than the market value of a modem chips. So Qualcomm collects royalties--as Qualcomm told the IRS--on the whole enchilada because it's "humongously more lucrative." But this means they charge for parts of the product they don't actually make any technical contribution to. The key term is "royalty base": What is the 100% basis against which whatever reasonable royalty percentage should be applied? Is the 100% a $1,000 phone? A hypothetical $400 phone? Or should it be a baseband processor (also called modem chip, or modem processor, or baseband chip)--which Qualcomm itself sells at $20 per unit and others sell at $10 or less? A smartphone is a mobile computer, with conventional telephone functionality representing just a limited part of it. But most of that smartphone functionality--such as playing computer games, listening to music, watching or recording videos--works over WiFi, too! And if something works over WiFi (in fact, many of those apps work better over WiFi than over cellular networks, which are slower and less stable in general), then there's no plausible basis on which a cellular SEP holder can collect a royalty on the commercial value of the related computing functionality. Mr. Cordell announced that Apple would get back to this point throughout the trial. I can see why. They won't have to talk about this every trial day, but when testimony--people confirming that everything works over WiFi (in fact, I quite often make WiFi calls where people call me on a cellular number or I call them)--shows to the jury that the very largest part of the value of an iPhone is not dependent on Qualcomm's modem chip technology, Qualcomm is going to have a problem persuading the jury of the opposite. Today was Day One of the Apple, Foxconn et al. v. Qualcomm trial in San Diego (Southern District of California). Formally, there are two cases, which the court combined under the official caption In re Qualcomm litigation. The reason for two cases existing technically is that a few months after Apple sued Qualcomm in January 2017, Qualcomm sued Apple's four contract manufacturers (Foxconn, Wistron, Pegatron, and Compal), who counterclaimed. The contract manufacturers' counterclaims became the economically biggest issue in the case, amounting to approximately $9 billion, which could be tripled (as a damages enhancement) to $27 billion. Qualcomm is seeking damages of up to $15 billion according to Reuters. The cases most closely related to the one being tried in San Diego as we speak are the U.S. Federal Trade Commission's antitrust lawsuit against Qualcomm in the Northern District of California (where Judge Koh might rule anytime now, given that the trial took place in January) and a consumer lawsuit alleging that 250 million Americans who bought smartphone over the last roughly eight years overpaid to the tune of $5 billion (an average of $20 per consumer) because of Qualcomm's accused business practices. Qualcomm appealed Judge Koh's certification of the consumer class action, but let's stay focused on the San Diego case (the real San Diego case, i.e. the antitrust case, as opposed to a patent infringement case that is a sideshow). In one of the strongest signs of there truly being one or more antitrust issues with Qualcomm's business practices, the company has for some time insisted that those entering into certain agreements with Qualcomm were not allowed to complain to antitrust regulators (theoretically, they had that option, but at a high cost due to an immediate termination of rebates and even a clawback of past kickback payments). Judge Curiel found no contract violation of that kind by Apple, a decision that is worth a few billion dollars to Apple. Today a jury of nine was selected, which means that up to three jurors could drop out (the trial might take about a month, though there are only four trial days scheduled for this week and three for each of the following weeks until jury deliberations begin) and they could still reach a verdict under the district court's Local Rules. There were some funny situations and remarks, but nothing specific happened today besides jury selection (and, which is unusual for a district court on the West Coast, a decision that no electronic devices with an active online connection could be used inside the courtroom, which is why live tweets didn't continue after the lunch break). Opening arguments will be delivered tomorrow, and that's when the trial really begins. On the eve of opening arguments, it makes sense to reflect on what this dispute is--and what it is not--about in high-level, philosophical, moral terms. The questions the jury will have to answer are unrelated to Qualcomm's history of innovation in cellular communications. Not only would no one doubt that Qualcomm succeeded a few decades ago with a courageous and ambitious bet on a technique called code division multiple access (CDMA), but it's also clear that Qualcomm has continued to invest heavily in research and development. No one claims they stopped innovating altogether. The dispute is all about whether they went, and are going, too far in their rent-seeking (and governmental agencies--antitrust enforcers--around the globe have so far found that it's the case, imposing fines that in the aggregate amount to several billion dollars). If all that Qualcomm had done since its initial success had been to keep innovating, and if there hadn't been any issues, then those competition watchdogs would have focused on other companies and this San Diego trial wouldn't have started because Apple would never have brought the underlying complaint. Qualcomm's patent royalty demands relate to entire mobile devices, including various components (such as more memory or larger screens) that are functionally unrelated to the layer of technology at which Qualcomm is innovative. As a consumer I can always use an Android device instead of an iOS gadget. But either way I'll pay the Qualcomm patent tax (ironically, the IRS described itself as Qualcomm's "silent partner," literally). That patent tax is artifically inflated by means of such practices as royalties on repairs, royalties on royalties (meaning that the royalty base for a royalty includes among other components the royalty), and interest on interest). They charge royalties separately from the prices of the chipsets they sell, though the longstanding judicial doctrine of patent exhaustion says that after you've sold a product you can't assert your own patents against it later. What's under attack (not only in this particular trial but in a host of cases as shown in the battlemap further above) is not Qualcomm's business model in its entirety, but certain problematic practices. Qualcomm will have a bright future either way. It will continue to create jobs. It will continue to rake in huge profits. It may, however, have to make some adjustments so as to ensure an allocation of resources that will work best for the economy and for society. This is a story à suivre. After this week's news of an EU General Court ruling against Qualcomm (related to the European Commission's enforcement of compliance with a couple of antitrust information requests) I also checked again with the Munich I Regional Court, mostly because I was curious about Qualcomm's recent contempt motion against Apple, alleging non-compliance with the injunction Apple has meanwhile worked around. Please check out my mid-February post on that matter because it summarizes the unusual circumstances (procedural shenanigans) under which an agnostic patent injunction came down and explains the workaround, which involved replacing an Intel baseband processor with a Qualcomm chip even though the accused component was a Qorvo envelope tracker chip. Not only did Qualcomm bring a contempt motion, which a spokeswoman for the court tells me hasn't been adjudicated yet, but in January it also became known (as I once mentioned in passing) that Qualcomm obtained a preliminary injunction from a different chamber (= panel of judges) of the same Munich court against Apple's public statements that the iPhone&nbsmp;7 and the iPhone 8 would remain widely available in Germany notwithstanding Qualcomm's enforcement. Meanwhile the court has confirmed to me that the deceptive-advertising injunction was based in the UWG (Germany's unfair competition law). I also have a case number now (1 HK O 257/19; the "HK" means it's a commercial dispute). And I learned that just on Tuesday the court lifted the competition law-based injunction, but hasn't stated the reasons yet. That one is a sideshow (deceptive advertising) of a sideshow (a fake patent injunction that had no serious impact), while the one that really matters is the Apple, Foxconn et al. v. Qualcomm antitrust case going to trial in San Diego on Monday over tens of billions of dollars. I still wanted to mention it because Qualcomm made some noise about this preliminary injunction when they obtained it, and by now it's an injunction that has ceased to be. I wouldn't rule out at all that Qualcomm's pursuit of that injunction was driven by some emotions on top of PR considerations (though they are extremely PR-oriented, and very good at playing that game). Qualcomm and its German lawyers--their lead counsel, Quinn Emanuel's Dr. Marcus Grosch, is really an amazing patent litigator--had fought very hard to win anything in Germany. Most of their German patent infringement cases against Apple went nowhere. Then, after several setbacks, they finally got one--though I consider it a highly illegitimate one, despite otherwise having great respect for the judge who handed it down and for counsel--and they thought it would give them leverage. They laid down more than $1.5 billion, an insane amount given that this case probably has an official value in dispute (based on which court fees are calculcated) somewhere in the range from 5 to 10, maybe 20, million euros (like the other German Qualcomm v. Apple cases). And then they saw that Apple removed those olders iPhones from its own German stores (for six weeks or so), but its major resellers (carriers like T-Mobile, Vodafone, and Telefónica/O2, but also retailers like MediaMarkt) just kept on selling as if nothing had happened, with some smaller resellers even mocking the injunction in their ads. It's a typical situation where each side of a cube has a different color and if you stand on one side, it looks green, and from the other side it looks red. I just described Qualcomm and Quinn Emanuel's perspective. They probably were upset about Apple seemingly disrespecting the injunction. But then my perspective is that it should be beneath the likes of Qualcomm and Quinn Emanuel--two world-class Q's--to obtain and enforce (!) an agnostic patent injunction when professional judges in the U.S. actually agreed with what was Apple's primary non-infringement argument. QE has a tremendous reputation for vigorously representing clients, and there's not even the slightest indication of them having done anything illegal here, but it's highly likely that this was an egregious case of utterly abusive, wrongful patent enforcement. Standard-essential patent (SEP) holders with ambitious monetization goals and aggressive tactics notoriously refuse to extend licenses to chipset makers. There's more than one reason for this, but besides the real reasons--the primary one of which is money--there are some cheap pretexts and excuses that they'll present when challenged. It's the next best thing to hypocrisy. I do appreciate it, however, when those companies come clean and tell it like it is. Ericsson, thankfully and boastfully, created an entire slide deck that explains it's just about (more) money plus a reduced risk of retaliation. That was just disarmingly honest. Toward the end of the FTC v. Qualcomm antitrust trial in January, a transcript of a 2012 interview conducted by the Internal Revenue Service (IRS) with some Qualcomm employees made it into the record over Qualcomm's lawyer's objections. Given how incriminating that document is from an antitrust point of view, and imagining how Judge Lucy H. Koh in the Northern District of California might view it especially in the strategically critical context of chipset-level licensing, it's easy to see why Qualcomm wouldn't want that transcript to be considered by any judge or jury in any dispute. After reading the transcript as a whole I've concluded that the IRS apparently conducted some sort of preliminary investigation of whether Qualcomm's corporate structure results in an underpayment of U.S. taxes due to (and this is not clear to me) either a violation of the arm's-length principle for inter-company charges between QTL and QCT (because of QTL, the licensing business, not charging a patent royalty to QCT, the chipset division) or because of the possibility of some revenues being taxed in foreign jurisdictions like China--or some combination. In any event, what matters here s what was said more so than why the interview took place, but I tried my best to figure out the context. The IRS wasn't being hostile in that interview. They were just trying to understand Qualcomm's business and were appreciative of the information they got. The Qualcomm licensing executives they interviewed were just trying their best to explain that their decisions make economic sense and that, between the lines, there was no tax avoidance or tax-shifting scheme there. In Judge Koh's courtroom in January, Qualcomm's attorneys also presented legitimate, if not even pro-competitive, business justifications for everything, even for the refusal to license rival chipset makers. But the story there was completely different from what they told the IRS. It was far-fetched stuff such as arguing that there'd be fewer licensees if you extend licenses only to device makers (and contract manufacturers)--but there's only a very few chipset makers in this space versus literally hundreds of device makers. What they told the IRS, however, is the true story. It's also pretty consistent with Ericsson's slide deck. And, especially, common sense. The revenue maximization part of that interview was already mentioned in January: "obviously the handset is humongously more ucrative for a bunch of -- a bunch of reasons." In the vicinity of that statement (page 72 of the PDF document), Qualcomm explains that royalties on handsets accounted, at the time (and probably still), for 95% of their patent licensing revenue stream. Elsewhere they explain that the chipset opportunity was just in the 1% range. The remainder would then be attributable to base stations. "Yeah, but if I would average royalty on all the handsets that we collect royalties on -- I don't remember what it is anymore, I used to know the number -- but if -- if it were ten dollars, for example, you couldn't charge a ten-dollar royalty on a chipset that cost five dollars, or six dollars, or seven dollars." His colleague Fabian Gonell then noted that "[t]heorectically you could, but as a practical matter you can't. As a practical matter it's hard." Mr. Blecker then added that "it would be hard to convince a court that that was a fair royalty also." "Right. No, we're your silent partner. We want for you to make a lot of money, for that to happen." And then Qualcomm's Mr. Blecker stressed again that it's on the handset where the money is." There are some other interesting statements in there. In particular, starting on page 25, Qualcomm explained to the IRS the doctrine of patent exhaustion, how it evolved, and how that evolution required Qualcomm to change its licensing terms so as to avoid exhaustion. They also explain how patent exhaustion is always something that adversaries in legal disputes might hold against them, so they have to be very careful to navigate around it. Ideally they don't want to do business with other chipset makers at all, but sometimes it can't be avoided, such as because the other party may have patents that Qualcomm wants to license (and typically exhaustively so it can tell its customers that they're covered). Early on it would have been possible to make a covenant not to sue a chipset maker, but then the Federal Circuit held that a covenant not to sue was tantamount to a license for exhaustion purposes, so as to avoid double-dipping. In response to that case law, Qualcomm then switched to a structure called a "covenant to sue last" (as I reported during the trial) or, more formally, a covenant to exhaust remedies, meaning that Qualcomm wouldn't sue a chipset maker unless it would have a problem to obtain and collect damages from the device makers who buy those chipsets. In other words, they'd have to sue a device maker first, and then the device maker would have to go bankrupt so they'd have a basis for suing the chipset maker--theoretically possible, but practically rather unlikely. As I wrote further above, the question is what Judge Koh will think of everything that's in that transcript. Her ruling could come down any moment now. And I think she already sees through all those smokescreens. Sure, there are patents that are not implemented in a baseband chipset, such as user interface or antenna patents. And there are patents that are't embodied in a baseband chipset alone. But cellular standard-essential patents are, and that's what she's held in an unrelated case (GPNE Corp. v. Apple) and in her partial summary judgment in FTC v. Qualcomm, which both Judge Gonzalo P. Curiel in the Southern District of California (at a recent hearing) and Judge James L. Robart of the Western District of Washington (at a Munich conference last Friday) appear to like as well. That IRS interview transcript just validates Judge Koh's and her colleagues' thinking. It's just clear that it's just about Qualcomm not wanting to go to court or conduct arbitration and argue over the reasonable royalty on a chipset when the end product--a smartphone or tablet--can serve as a far higher royalty base to start from. What's almost funny in that transcript is how those Qualcomm licensing executives--all of whom are lawyers--remind each other of not making definitive concessions regarding the law. For instance, each time one of says some kind of contract may be exhaustive, someone else says "may be," even when they're all convinced it's simply certain to be the case. Finally, from a competition policy perspective it's also interesting to read what they say about a contract term under which they require rival chipset makers to disclose their customers and the number of units they ship to them. They concede in the interview that it's very helpful for them to obtain such information on a competitor's business, and they try to impose that term whenever and wherever they can, but sometimes they don't have enough leverage to get all that they want and may then focus on other contract terms. Another problematic term that was also mentioned already in the FTC trial is that they get other chipset makers to promise not to sell chips to device makers that don't have a patent license from Qualcomm. Such a contract clause enables Qualcomm at least to threaten with the pursuit of an injunction against shipments by a chipset maker to an unlicensed device aker. There were two developments yesterday in connection with Qualcomm's antitrust issues. First, the EU General Court (which used to be call the European Court of First Instance) handed down a judgment that upholds the entirety of the European Commission's March 31, 2017 decision that Qualcomm would incur a daily fine of 580,000 euros for non-compliance with two information requests after specified dates (May 12, 2017 for one of them, and May 26, 2017 for the other). The EU General Court already denied in July 2017 a Qualcomm motion to stay the order, as I mentioned in this post. Apparently Qualcomm then had to comply (though it still appealed the decision), and the investigation of Qualcomm's exclusivity arrangements and predatory pricing further to a complaint by Icera, a once-European semiconductor company acquired by Nvidia (and shut down later). At first sight one may wonder why Qualcomm would be accused of overcharging in one context and of predatory pricing in another, but the two theories can be reconciled: Qualcomm's supra-FRAND royalties enable the company to impose a tax on everyone and to sell chipsets, especially in the low-end segment, at a lower cost than Qualcomm could if it contented itself with FRAND royalties. It's one of the ways Qualcomm benefits from a business model that flies in the face of all we know about the concept of patent exhaustion. This is a long document and I've mostly published it here as reference material for the upcoming trial. I haven't fully digested it yet, but it reflects the judge's prior categorization of the case as primarily an antitrust/FRAND and only secondarily a contract dispute. The way the defenses to the parties' different claims are presented is consistent with what Apple had proposed: to list the defenses after each claim. Qualcomm had argued it would have been more efficient to discuss the defenses just once (and then apply them to multiple claims). What both parties appear to be fine with is that the judge will interpret some disputed contract terms after the presentation of evidence, but before jury deliberations. Don't be puzzled by the official date of the order. It came down on April 9, but with retroactive (ex tunc) effect. There's probably something more in that long document that's worth talking about, and I'll take a closer look between now and the start of the trial on Monday. It is high time that the automotive industry stopped being the ideal target of shakedown attempts by standard-essential patent (SEP) holders due to its sheer size, the high prices of its end products, and its pacifist attitude. For a long time, car makers used to be on the sidelines of major disputes. They generally resolved any IP issues out of court, respecting exclusionary rights in some cases and cross-licensing (or simply refraining from hostilities) in many others. But times have changed, and with cars increasingly becoming smartphones on wheels, those car makers are no longer dealing with a herd of sheep when it comes to patent assertions but have entered a jungle teeming with predators. As a result, they must confront those challenges more decisively, lest they be eaten alive. Against this backdrop I'd like to promote (not getting anything for it) an upcoming Munich conference hosted by the Bardehle Pagenberg firm: Automotive Patent wars -- To pay or not to pay: That is the question." on May 9. The three words "for all users" are interesting. This wording at least makes it plausible that Daimler's complaint relates to Nokia's refusal to extend SEP licenses on FRAND terms to certain component suppliers. The motivation would obviously be for Nokia justify its royalty demands with the end price of an entire car, or substantial parts thereof. What reinforces this impression is the subsequent filing of a complaint by a medium-sized company (that just employs about 2,300 people; a midget compared to Daimler) named BURY Technologies, but instead of burying the hatchet, they're throwing down another gauntlet to Nokia. Yesterday (Monday, April 8), BURY Technologies announced its EU antitrust complaint against Nokia, alleging that "the Finnish group had refused to grant licenses for mobile communications components from BURY." The official press release refers to a "cartel complaint," which is just an incorrect translation of the German word "Kartellbeschwerde" (which broadly covers any complaint with a competition enforcement agency): it's not about Nokia having formed a cartel with others, but about unilateral conduct by Nokia as a SEP holder. It's not hard to imagine that a relatively small company just doesn't have a lot of expertise in the area of competition law. The fact that this complaint was filed in relatively short succession to Daimler's makes it fairly likely that there was some coordination behind the scenes, except that Daimler would know the difference between antitrust and cartels. The question of component-level licensing is also the key issue in the FTC v. Qualcomm dispute in the Northern District of California. Just like one of the world's most famous FRAND judges, United States District Judge James L. Robart, I also think Judge Lucy H. Koh's FTC v. Qualcomm ruling could come down any moment. Daimler's and BURY Technologies' complaints over Nokia's conduct with the EU Commission show that this is a global issue, and Judge Koh has the potential here to be a global thought leader, like Judge Robart became one with respect to FRAND rate determinations (and in the U.S., with respect to antisuit injunctions against SEP abusers). Having watched Nokia in litigation over many years (even going back to its first dispute with Apple), and the unfortunate (for Nokia and its stakeholders, though not for consumers) demise of its mobile device business that changed its attitude toward patent monetization, I'm not surprised that it apparently made demands that Daimler wasn't willing to meet without a fight. Daimler is also defending itself against Broadcom's German lawsuits (as is BMW). With all that's going on, this blog may have to take a closer look at automotive patent cases going forward just because of a huge overlap with smartphone issues. For now, I really hope the European Commission will launch formal investigations of Daimler's and BURY Technologies' complaints. The best-case scenario would be for the U.S. to clarify the question of component-level licensing on the basis of a ruling by Judge Koh and for the European Commission to do so at the end of an antitrust investigation. GAFA (Google, Amazon, Facebook, Apple). The GAFA companies are U.S. companies, and the tech sector is a significant part of the U.S. ecoomy, so the fact that this group of companies is nevertheless additionally listed at a level with the three global superpowers says a lot. What she says is that in the face of those challenges, "Europe has to make others respect it" (I purposely translated this fairly literally). It's a rather combative statement. Just prior to the list of rivals she stresses that "there won't be a strong France without a strong Europe," and that's the problem. Macron ran on a pro-European platform, but his vision for Europe is one of putting French interests and the French school of thought first and demanding that the rest of Europe follow because he knows, as Mrs. Loiseau does, that France alone is too weak. The idea of being stronger together than alone is shared by the political establishment across continental Europe. German politicians basically say the same. But there are different approaches, especially to economic policy and, by extension, IP policy: "social market economy" (the German policy goal, which is also shared by large parts of Central and Northern Europe, and the post-socialist transformation of the Eastern European economy is driven by similar ideas) vs. a statist (heavy-handed government), centralized system as the one favored by France. a weak SME (small and medium-sized enterprises) segment. They even have a state-owned patent troll (France Brevets). The French approach just isn't working in the Digital Age. There are exceptions, such as two French games companies that I highly respect: Ubisoft and, more recently, Voodoo, which focuses on "snackable" minigames and generates huge numbers of downloads. But Northern Europe is way stronger (even in interactive games). In December, Gunnar Heinsohn, a professor emeritus who's both an ecoomist and a sociologist, published an article (in German) entitled "Why France is beyond salvation." The article mentions that South Korea is now filing almost twice as many international (PCT) patent applications per year as France, though its population size is about 25% less than that of France, and the average French IQ is only 98, with immigrants averaging only 92. According to the OECD, France has the least qualified immigrants of all 36 OECD nations. When TIMSS (Trends in International Mathematics and Science Study) was conducted for the first time, back in 1995, French students were ranked 13th in the world, but over the course of the next 20 years, France dropped by more than 20 ranks to #35, behind Qatar and Abu Dhabi. In light of all of those facts, Professor Heinsohn concludes that "it's over," and nothing can be done anymore to bring France back on track. He could have pointed to additional facts. According to TIMMS, the performance of French students is below that of any other large EU member state. By comparison, in the UK's strongest region, Northern Ireland, 27% of all students are top math performers, more than ten times the percentage of France (2%). And based on what I hear from experts, the brain drain is massive, with a significant percentage of the best French engineers and scientists being hired by U.S. tech companies. That is the backdrop against which Mrs. Loiseau wants Europe to make France stronger as it takes on tech giants. The alternative would be for France to focus on strengthening its own digital economy, but apart from the likes of Ubisoft and Voodoo, France is lost. Macron would like it to become a "Startup Nation," but Bloomberg and others have explained it's just not happening. French politicians can't say so publicly, but since their country's failure in the digital economy is definitive, they're just interested in taxes and regulation. More than anything else, they'd like to get Europe to impose a Digital Tax. They won't ever stop pushing for it until they get it, but so far there's sufficient resistence. In terms of regulation, they want legislative measures as well as aggressive antitrust enforcement. The EU Copyright Directive (officially: Directive on Copyright in the Digital Single Market) is a mix of (indirect) taxes and regulation: while Europe's market share among content-sharing platforms is extremely low (almost nothing but Spotify), the share of European creatives in the market for content consumed by European users is obviously far higher. Unfortunately, a liability regime that practically requires upload filters will cause a number of issues, and by now even the German coalition parties appear to realize that it was a big mistake to support the French proposal. Yesterday, Tiemo Woelken, a German social democratic MEP who opposes Article 13 (now Article 17; the "upload filter" paragraph), tweeted about a Reuters report according to which the German government is divided over the issue because Federal Minister of Justice Katarina Barley would like to attach a (legally non-binding) statement to the impending EU Council decision, according to which Germany would transpose the directive into national law without mandating upload filters, but Merkel's Christian Democratic Union/Christian Social Union opposes doing so. Technically, the German government would actually have to abstain as long as this disagreement isn't resolved, and an abstention would have the same effect in the EU Council as a No vote. Without Germany, there's no qualified majority as Italy, Poland, the Netherlands, Finland and Luxembourg already oppose the bill. We'll see what happens. Brussels insiders expect that the next major digital policy battle in the EU will involve a replacement of the eCommerce directive (officially named Directive of the European Parliament and the Council on certain legal aspects of information society services, in particular electronic commerce, in the Internal Market). The version that is currently in effect was promulgated in 2000. At the time, Google was two years old; Facebook was founded four years later, and it took another four years before Apple's App Store opened. It's foreseeable that EU politicians, with French parties at the forefront again, will try to seize this opportunity to further regulate the digital economy. That's the wider context of Mrs. Loiseau's statement. It would lead too far now to go into detail on how the rest of Europe views this, but generally speaking, other southern European countries are pretty much on the same page, and in Germany the political establishment is fairly willing to support Macron as long as the negative effects on the German economy aren't too obvious. Judge Robart watching Qualcomm antitrust cases from far up north, finds rebates tied to antitrust gag order "an interesting case"
Of the two-day Munich conference on patent injunctions that just ended, I was primarily curious about what certain judges had to say. Yesterday it was interesting enough to witness a clash of legal cultures with respect to injunctive relief and the proportionality requirement under EU law. Today's superstar speaker was Judge James L. Robart of the United States District Court for the Western District of Washington, famous in patent circles for his antisuit injunction and FRAND determination in the Microsoft v. Motorola FRAND enforcement case--and known to a wider audience for being (now quoting President Trump) "that so-called judge" who enjoined the federal government from enforcing Trump's original travel ban, though it turned out the Supreme Court viewed the law completely differently, and Rush Limbaugh highlighted how Judge Robart got even basic facts about the connection between migration and terrorism wrong (what's actually worse--being criticized by talk radio or by a blogger?). I really thought the attorney who argued for the Department of Justice in that latter case (the related TRO hearing was broadcast) did a great job, and the points she made there were essentially the ones that a different attorney later made in the Supreme Court, but with a better outcome. Judge Robart is a great speaker with a sense of humor everyone appeared to like. Despite my fundamental disagreement with his handling of the travel ban case, I must say his speech far exceeded my expectations--even the ones I'd have had exclusively based on the groundbreaking antisuit injunction. The title of Judge Robart's presentation was "The view from the corner of competition law and patents." He started with an explanation of U.S. rules governing patent injunctions, particularly eBay v. MercExchange. When he explained that non-practicing entities suing companies like Microsoft (because they're headquarted in his district) with multifunctional products, they'll hardly be able to show irreparable harm. And he jokingly noted that Germany wasn't the place to outline this take on patent injunctions. But unlike Justice Arnold from the UK, who clashed with Judge Dr. Grabinski of the Federal Court of Justice of Germany yesterday, Judge Robart presented the perspective of another jurisdiction and didn't insinuate that Germany is in breach of EU law because of its courts' approach to patent injunctions. Since none of the Qualcomm antitrust or patent infringement cases is pending in Judge Robart's district, he was free to talk a bit about those cases--FTC v. Qualcomm as well as Apple v. Qualcomm, and more generally about Qualcomm's business model. It became clear that Judge Robart thinks very highly of Judge Lucy H. Koh (Northern District of California) and Judge Gonzalo P. Curiel (Southern District of California; he referred to him as "[his] friend," presumably not only because both had been the target of judge-bashing by Donald Trump). That wasn't just professional courtesy. It was genuine. Judge Koh is currently working on the FTC v. Qualcomm ruling, which Judge Robart also thinks is likely to come down soon. Judge Curiel is presiding over the Apple v. Qualcomm antitrust case in San Diego, which is scheduled to go to trial in ten days--and which Qualcomm unsuccessfully sought to style as a contract dispute. I interpreted Judge Robart's comments on Judge Koh's summary judgment ruling as him being very supportive of the notion that standard-essential patent holders should extend SEP licenses on FRAND terms to rival chipset makers. Judge Robart highlighted two aspects of Qualcomm's business model. The first one was Qualcomm's refusal to license competing chipset makers, and he sounded skeptical of whether that conduct is legal. The second one was the fact that Qualcomm charges high nominal royalties only to bring them down through rebates in exchange for licensees promising not to bring antitrust complaints, which Judge Robart called "an interesting case"--a remark that provoked laughter from the audience. Maybe Judge Robart has the same position on gag orders as I've expressed here before: such contractual arrangements shouldn't be enforceable. He didn't explicitly say so, but despite his in-depth experience in adjudicating FRAND SEP cases, it really appeared Qualcomm's business model raised issues that he finds unusual. As do other judges. And regulators. And... bloggers. The Qualcomm cases are very high-profile, and, quite frankly, there was no way Judge Robart could have avoided referencing them in a talk on "the corner of competition law and patents." And when one talks about Qualcomm, it's impossible not to notice that its business model presents an extreme case. Maybe "interesting" was Judge Robart's diplomatic understatement of "extreme." Both the Erlangen conference of two weeks ago and this week's Munich conference had overlapping topics, and partly overlapping speakers. In particular, Professor Thomas Cotter (University of Minnesota), whose Comparative Patent Remedies blog covers those conferences in more detail, gave basically the same talks in both places. The Erlangen conference was more political (basically an academic conference with a view to an upcoming legislative initiative), while the Munich conference may have provided more depth to academic attendees. Qualcomm attended the Erlangen conference. I don't know if anybody from Qualcomm was in the room today when Judge Robart spoke. If so, I guess the person was not amused. The Anti-Counterfeiting Trade Agreement (ACTA) was the next example (I wasn't involved), and the most recent--and still ongoing--one is the EU Copyright reform process (I only helped out in some limited areas toward the very end of the multi-year process). The recent vote that went awry in the European Parliament (a dozen MEPs later declared in writing they had pressed the wrong button) was described by the proponents of Internet upload filters and similar anti-innovative measures as the de facto closure of the process. But the fire is still raging, and the opera isn't over until the fat lady sings: the EU Council has yet to make its formal decision. A mere formality, say the proponents. But that formality is costing the German government coalition parties dearly, and while Merkel's Christian Democratic Union/Christian Social Union (CDU/CSU) used to bear the brunt of people's well-founded outrage, the junior coalition partner, the Social Democratic Party (SPD), is now in serious trouble as the SPD totally fell out of favor with young German voters yesterday evening. #NieMehrSPD, a vow never to vote for the SPD again in one's lifetime, became the #2 trending hashtag on Twitter's German-language service yesterday, second only to the wildly popular Germany's Next Top Model casting show. The SPD is going to get little voter support in next month's EU elections, and is going to have catastrophic results in some regional elections later this year. It could be that pollsters (though they rarely think outside their traditional boxes, which is a large part of the reason why they get things wrong by huge margins all the time) will attribute the SPD's lack of popularity with young voters at least in part to the #Article13 (now #Article17) debate. More likely, they'll remain clueless. But the effects of the SPD's strategic error will last for a long time, regardless of whether the pollsters will ever find out. What happened yesterday is that the SPD, even though its European Parliament delegation (not its sister parties in other countries, though) overwhelmingly voted against upload filters, sided with its coalition partner, Merkel's CDU/CSU, in yesterday's debate in the Bundestag (Federal Parliament) over two motions for non-legislative resolutions calling on the German government to oppose the bill in the EU Council. With Italy, Poland, the Netherlands, Finland and Luxembourg already opposing the bill, it would just take a German No to reopen the debate and start a quest for a better mouse trap. I translated the libertarian Free Democratic Party's (FDP) motion, which was masterfully written by their digital economy expert Jimmy Schulz, and I can assure you that the Left Party's motion, which I saw only yesterday, was at the same level and, unlike what some might suspect, absolutely not ideological. Either motion made clear that creatives should receive proper protection on the Internet, but that this particular bill would put Europe's Internet and IP policy on the wrong track. The SPD used to blame everything on Merkel and her party. There was a deal with France that involved the Nord Stream 2 gas pipeline that resulted in Germany's consent to upload filters despite a clear wording in the CDU/CSU's written coalition agreement with the SPD; and the CDU's Axel Voss MEP rose to negative fame as the European Parliament's rapporteur in charge of the directive, while the SPD, not unanimously but overwhelmingly, voted against the bill in the European Parliament's March 26 plenary vote. Also, the SPD's Tiemo Woelken ("Wölken" in German) MEP was really fighting harder for our cause than anybody else save the Pirate Party's Julia Reda MEP. But the European Parliament vote didn't solve the problem, while the German government could still remedy the situation in the EU Council (the actually more powerful EU legislative body, which is controlled by the Member States' national governments). The EU Council wouldn't have a qualified majority for the bill without the German government, and the German government wouldn't have a majority in its national parliamentary democracy without the SPD. Plain and simple. Furthermore, the SPD's Katarina Barley is the Federal Minister of Justice, and IP policy falls within the remit of her ministry (other ministries have a secondary role at best in this context). She's also the SPD's top-listed EP candidate (after the EU elections, she'll step down in Berlin and make the leap to Brussels and Strasbourg). One of her predecessors in office, the FDP's Sabine Leutheusser-Schnarrenberger, once resigned because she couldn't possibly support a legislative measure (relating to eavesdropping). Mrs. Barley, however, is anout to down in history as someone who mistakenly thought she could have her cake and eat it, and wherever she will go and whatever she may do in the future, the Internet generation's thumbs-down for her will be a given--unless she recognizes the situation and fixes the problem. Should Sweden indeed change it state from Yes to No in about a week, the situation in Germany will heat up again for sure. The motions that the German parliament debated yesterday evening represented--as the Left Party's Petra Sitte said in her opening statement--an opportunity for the SPD to alter course while it still can. The SPD could have supported those parliamentary motions in order to provide a democratic justification for an admittedly unusual about-face by Germany at the EU level. The motions would have paved the way for a search for a better approach than the ill-conceived bill that is on the table and scheduled to be adopted on April 15. Of course, a government coalition party voting in favor of a motion by the opposition would consitute sort of a government crisis--but it could have been contained because the rest of the EU wants Merkel to stay in office as long as possible, so even Macron would have rather given up on Article 13 (now Article 17) for the time being than push Merkel down the political cliff over copyright. What the SPD decided--and what triggered the shitstorm that made #NieMehrSPD the number two trending hashtag in Germany at prime time--was, however, to cave. In a transparent procedural maneuver, they SPD joined the CDU/CSU--in the debate and in the vote--in effectively voting both motions down by referring them to the parliamentary committees, where the process will take far too long for the actual plenary vote (on substance) to be held before the EU Council will (normally, though nothing is necessarily normal anymore) have adopted the bill. As per a suggestion by a former Pirate Party MEP from Sweden, Amelia Andersdotter, I live-tweeted the most important soundbites from the debate and shared my observations in English. At times the livestream slowed down due to the heavy load. Germany's leading YouTubers were all following it, and one of them, Herr Newstime, had already announced a few days ago that he left the SPD after having been a member for well over ten years. The SPD's doublespeak has failed. They--and particularly Mrs. Barley--apparently thought they'd get away with schizophrenia, saying No in the European Parliament but Yes in the EU Council (instead of holding the CDU/CSU to the coalition agreement). The EU Council has little visibility, though in this particular context, a large number of mostly young people learned Council lingo like "COREPER" and the final adoption of the copyright bill will definitely get an unprecedented level of attention for that kind of procedural step (while I don't expect next weekend's demonstrations to be nearly as large as the one at which I spoke on March 23). But the German Bundestag has great visibility, thus the #2 trending hashtag. Before anyone claims that this was a fake campaign or a mob of bots or whatever, let me launch a pre-emptive strike against any such conspiracy theory. Axel Voss, the controversial German conservative Member of the European Parliament best known for his push for Internet upload filters, alleged Google's strategy to influence legislation in this context was "government by shitstorm," when in reality he has no one but himself and the people in charge of his party delegation's Twitter account to blame. Google, Facebook or any other Internet company played no role in the shitstorms he referred to: in fact, those shitstorms started within seconds of some stupid and/or offensive utterances, and anybody who's ever had a real job and dealt with companies of any size knows that even a startup couldn't orchestrate an instant shitstorm, much less a large and bureaucratic organization. Google is the new Russia in this regard. Mr. Voss's Christian Democratic Union (CDU) has already gone through plenty of shitstorms in connection with Internet policy, including that a few years ago Merkel referred to the Internet as "Neuland" ("new (unchartered) territory"). There actually is an entity named #CNETZ that is affiliated with the CDU and its sister party, the Christian Social Union (CSU), and their understanding of what makes the Internet--and the Internet economy and community--tick is so much better than that of the CDU/CSU's MEPs that the difference can't ben even be quantified by means of a factor. But ultimately, the CDU/CSU makes decisions that have consequences, while #CNETZ merely advances recommendations, and voters who care about Internet policy focus on the bottom line: on what ultimately comes out of a political process. That said, #CNETZ is an entity with which I believe we should engage in constructive discussions going forward. Despite #CNETZ, the CDU/CSU is simply not an option for the Internet community in the foreseeable future. Damages control is all that it can achieve, and even that one is going to be hard. The SPD, however, has Tiemo Woelken MEP--a lionheart in the European Parliament and a sheep at home. He's young, he's a career politician, and he owes his seat in the EP to a self-contradictory party with a backwards-oriented leadership that believes a hashtag is a regional dish or music style. Mr. Woelken is displaying his disappointment, and I can see why he's brokenhearted, but what I've instead encouraged him (via Twitter) to do is to use the trending hashtag as ammunition in the internal fight. He didn't publicly call on his colleagues back at home to vote for those motions; maybe he did so privately (I'm sure that if he had any communication in recent days with anybody in Berlin, he will have done so), but that's not enough. He's not enough of a maverick who would openly oppose the party line. And that's why I think it would be morally, but not strategically, appropriate to feel much sympathy for his misery. Life's unfair--after the accidental EP vote and the SPD's acquiescence to the CDU/CSU's breach of the German government coalition agreement, our anti-upload-filter movement really knows. It's unlikely, but nothing is 100% impossible in politics if it's legally possible (and even illegal things sometimes happen, but that's another story and not an issue in the copyright reform context), that the SPD will recognize its error. In the age of social media, you can't fool people. They don't buy your crap. They'll be informed, and while the CSU's Alexander Hoffmann demonstrated incredible talent yesterday by defending the indefensible and generously accepting three questions from the parliamentary opposition, all speakers opposing upload filters did a great job, each of them in their own way: I mentioned Petra Sitte (Left Party) before; for the FDP, Roman Mueller-Boehm ("Müller-Böhm" in German); for the Alternative for Germany (AfD), Joana Cotar; and for the Greens, Tabea Roessner ("Rößner" in German). Those four parties cover a broad spectrum, but none of them tried to gain any ideological mileage from the copyright debate: each and every one of them did exactly what our own activists would have said in that same situation. The government coalition parties had little more to say than to ridicule the opposition's concern for the CDU's compliance with the coalition agreement--but that's unrelated to substance, and if any party is now going to be viewed by countless (mostly young) voters and future voters as hypocritical, it's the SPD. Absent a miracle, that is. Today was the first day of a two-day conference on "Injunctions and Flexibility in Patent Law - Civil Law and Common Law Perspectives" organized and hosted by the law school of Ludwig Maximilian University in Munich, Germany. A conference held 100 miles up north, in Erlangen, two weeks ago had practically the same focus, and that's where I learned that the German government is working on a legislative initiative tha may represent a departure from the principle of non-standard-essential patent infringements automatically resulting in injunctions. However, the earlier-held conference was more political in the sense of speakers taking pretty clear position on what they'd like the law to be (or to remain), while the ongoing Munich conference is more academic than political. "There are no ifs or buts. "There is no room for debate. When citing to CJEU case law, Justice Arnold emphasized several times that the enforcement directive as well as certain CJEU decisions referrednot merely to the transposition of the directive into national law by the Members States' legislatures but also to the obligation of Members States' courts to take the proportionality principle into account. Most of the time, judges speaking at conferences focus on abstract questions and on their own jurisdiction. It's highly unusual that judges would publicly tell colleagues serving on other courts what to do, with exceptions such as a U.S. Supreme Court justice calling the Eastern District of Texas a "rogue jurisdiction" proving the rule. And again, Justice Arnold didn't specifically name Germany--but he did make an unequivocal statement on what his colleagues in all EU Member States are supposed to do, and he was doing so in Germany, which is simply known for granting automatic injunctions in non-standard-essential patent cases. The next speaker was one of Germany's highest-ranking patent judges: Judge Dr. Klaus Grabinski of the Federal Court of Justice. Almost five years ago I had the honor to be on a panel with him at another German university, and he's been a key player in preparations for the future Unified Patent Court (UPC). Last time I heard Judge Dr. Grabinski speak, he was much more soft-spoken. Today, he was about as energetic as Justice Arnold, and without referring to the previous speaker, he was fighting hard to defend the current German perspective on patent injunctions. First, Judge Dr. Grabinski argued that "proportionality" is just a term and he'd like to know more precisely what it's supposed to mean. Second, he explained (in other words) that injunctions simply are the standard remedy for the exclusionary right that a patent is. Third, Judge Dr. Grabinski described as applications of the principle of proportionality certain limits to the automatic grant of patent injunctions in Germany, such as enforcement stays, grace periods (he focused on "use-by" periods), security required for the enforcement of an injunction while it is being appealed, etc. Despite an interesting and persuasive presentation, I still believe that what Justice Arnold meant is actually right: it's not just about the specifics of an injunction, or an exception for outright antitrust violations, but EU law mandates a proportionality analysis before granting any injunction whatsoever. Of course, it would take a specific decision by the CJEU, with someone appealing a German court's approach to the top EU court, to have greater clarity as to whether the concept of proportionality begins with the binary question of whether an injunction issues in the first place. But I do subscribe to Justice Arnold's reading of the statute and of EU-level case law. Those two judges obviously came from different starting points. In common law, injunctive relief is an equitable remedy; in civil law, it's a legal remedy. Also, common law makes a clearer distinction between property rights and liability regimes (as Professor Thomas Cotter from Minnesota explained again today, as he already did at the other conference the week before last). 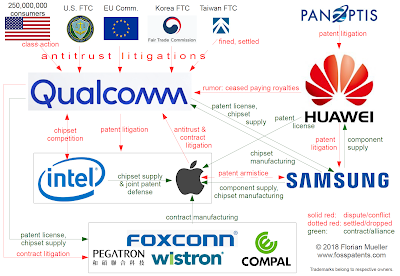 Unfortunately, German patent judges very much take a property-centric approach to IPR enforcement as I stated a few days ago in connection with an Unwired Planet v. Huawei decision that I think is right for the wrong reasons. But I think there's something more fundamental to it. Common law judges have a different approach to statutory interpretation, and they're used to following applicable case law. By contrast, continental European judges have greater liberties, and they take them. Any German patent reform seeking to address the issue would have to make it absolutely clear that proportionality-based considerations may result in a wholesale denial of injunctive relief in a given case, not just some tailoring ot the injunction or an exception for cases where another law would otherwise be violated. What I can say from my vantage point is that German patent decisions, at least by the regional courts with which the original complaints must be filed, generally don't reflect any proportionality analysis. At least I've never seen one, and I've seen many such decisions (though they don't all get published). Whether the European Commission would at some point fine Germany for non-compliance with the EU IPR enforcement directive is doubtful. But Germany can avoid that problem altogether through a patent reform that will protect companies making highly multifunctional products (automotive, telecommunications etc.) against patent holdup. Apart from PR, the mid-March verdict that a San Diego jury rendered in Qualcomm's favor over three patents isn't overly useful to Qualcomm in its own right as the damages award of §31 million is insignificant compared to what's really at stake between the patent-leveraging chipmaker and Apple (with the big showdown scheduled for April 15). It's just a companion case over a complaint mirroring a request for a U.S. import ban that went nowhere in the ITC--though Qualcomm can, of course, appeal the ITC decision to the Federal Circuit and is taking the unusual previous step to ask the U.S. trade agency to reconsider its patent invalidity finding. On March 26, Judge Dana M. Sabraw of the United States District Court for the Southern District of California requested briefing on whether a Rule 54(b) judgment--final (thus appealable), but with respect to a subset of the claims in the case--should be entered or not. Apple's motion for judgment as a matter of law (JMOL) is pending anyway, but the court could rule on it in the short term so as to conclude the part involving Qualcomm's offensive claims at the earliest opportunity, or it could await the outcome of the second trial (scheduled for mid July), where Apple's offensive counterclaims (i.e., Apple alleging that Qualcomm infringes some of its patents) will be put before another jury. Neither party favors Rule 54(b), but for disparate reasons. Qualcomm's position is that the court should sever Apple's offensive claims and enter a final judgment. In terms of appealability and enforceability, I can't see what different it would make, so I believe Qualcomm just feels the court has more discretion to sever the remainder of the case (as it already decided to bifurcate the case). For Qualcomm, Rule 54(b) is at least the second-best choice, while Apple proposes to wait until its own offensive claims have been tried. The statute requires a determination by the court "that there is no just reason for delay," and Ninth Circuit case law requires a "pressing reason" for a Rule 54(b) judgment. Even though Apple may have brought its offensive claims relatively late (about six months after Qualcomm's original complaint), I think Apple was disadvantaged by bifurcation. The whole Apple-Qualcomm dispute was never about Apple seeking money from Qualcomm, but the other way round. Therefore, Apple's offensive counterclaims were actually a defensive measure: I'm convinced they just wanted to have a more symmetrical situation in front of the jury. It's not just that the trial would have been more balanced in terms of Apple also accusing Qualcomm of some infringements, but Qualcomm's lawyers would have had to make some of the same defensive arguments that Apple had to make. Also, Apple could have played the game that Samsung played in the 2014 trial of the second Apple v. Samsung case in the Northern District of California, where Samsung sought a relatively modest amount of damages, which may very well have influenced the jury's perspective (indeed, the jury's damages award ended up being only about 5% of what Apple was seeking). I can think of only one high-profile case where a party with a defensive motivation didn't benefit from its offensive counterclaims: the first Apple v. Samsung trial in the Northern District of California. In that case, Apple asserted a mix of some non-technical, purely visual intellectual property rights (design patents, trade dress) and software patents covering visual, even iconic features, while Samsung counterclaimed over rather technical (partly standard-essential) patents that are harder for a jury to figure out (and was rather aggressive on damages). But in that Qualcomm v. Apple case in San Diego, both parties' patents-in-suit would have been similarly technical in nature, so there would have been a very high degree of symmetry. "In the parallel ITC investigation, the ITC issued a Final Determination finding the single asserted claim of the '490 patent invalid. Qualcomm has publicly stated that it 'will seek reconsideration by [the] Commission in view of the jury verdict' here, which it claims is 'inconsistent.' ALJ Rules in Favor of Qualcomm in Patent Infringement Case Against Apple at the U.S. International Trade Commission, Mar. 26, 2019, available at https://www.qualcomm.com/news/releases/2019/03/26/alj-rules-favor-qualcomm-patent-infringement-case-against-apple-us. Of course, there is no inconsistency between the Commission's invalidity determination and the jury's verdict, which did not even consider validity for the '490 patent. Even so, adhering to the normal policy of entering judgment in this case only after all claims are resolved may help deter Qualcomm from attempting to leverage a partial final judgment to improperly attack the ITC's Final Determination." But the ITC-San Diego overlap is a fairly important part of what this is about. San Diego is just a PR thing and potential consolation prize for Qualcomm (and it remains to be seen what will happen at the JMOL stage). The ITC exclusion order (U.S. import ban) is what Qualcomm really wanted, and the motion for reconsideration will most likely be denied by the ITC, so Qualcomm needs a successful appeal to the Federal Circuit. Time is not on Qualcomm's side in another regard: Apple has been quite successful petitioning the Patent Trial & Appeal Board (PTAB) of the United States Patent & Trademark Office (USPTO) for the institution of inter partes reviews of various Qualcomm patents-in-suit. That fact is also why I believe Apple elected not to pursue its invalidity arguments (other than inventorship in connection with the '949 patent) in San Diego at some point: "[M]idway through trial, Apple announced that it had elected not to pursue any art-based invalidity defenses." Juries rarely invalidate patents, so Apple presumably determined it made more sense to have the PTAB rule on (in)validity. That will take time, but the longer things take (including a potential delay resulting from a final judgment having to wait until after the trial of Apple's offensive counterclaims), the more likely Apple is to get some favorable PTAB decisions that will bolster its appeal. Toward the end of its Rule 54(b) briefing, Apple points to testimony by Qualcomm's own damages expert that may make it quite easy for Judge Sabraw to just hold off on any judgment here: "Both large profitable companies. Really high credit ratings, good balance sheets. Nobody needs cash, right."